The danger of all-out nuclear war is two-fold. One is that a leader of a nuclear-armed nation may launch a first strike in hope that the target nation will not be able to retaliate. The other is that the leader of a nuclear-armed nation may think another nuclear nation has launched or plans a first strike. Although neither the American and the Soviet/Russian governments has been willing to give up the option of all-out war, the two governments have over the years made treaties to make all-out war less likely. But since the dawn of the 21st century, the U.S. government has moved backwards. President George W. Bush withdrew from the anti-ballistic missile treaty in 2002. President Donald Trump has announced the U.S. will withdraw from the INF (intermediate nuclear force treaty. 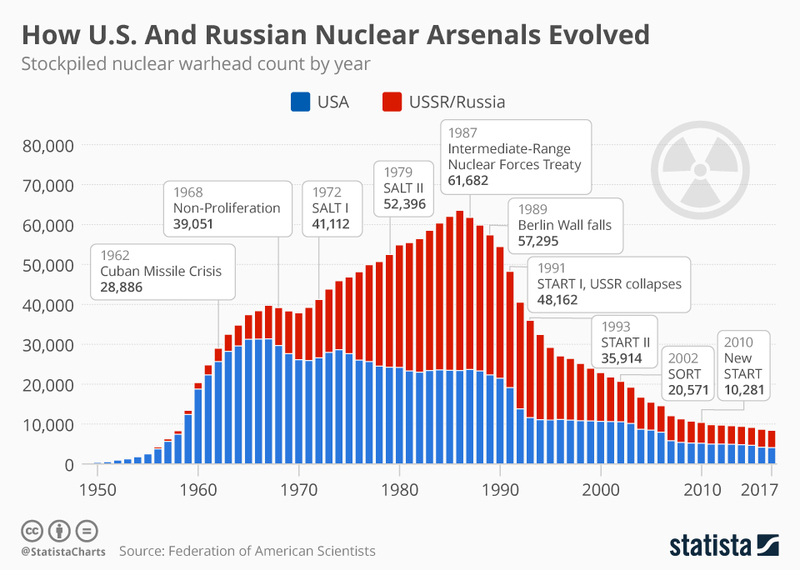 There is a possibility that the strategic arms reduction treaty) will not be renewed in 2021. Arms control treaties can give a false sense of security. They do not eliminate nuclear weapons, only stabilize them. But without such treaties, the danger would be much greater than it is. ABM Treaty. The anti-ballistic missile treaty was signed by Richard Nixon and Leonid Brezhnev in 1972, after nearly 10 years of negotiation. The USA and USSR agreed to limit themselves to 200 anti-ballistic missiles—missiles intended to shoot down intercontinental ballistic missiles—at two sites.. Later this was reduced to 100 ABMs at one site. Missile defense against short-range and intermediate-range missiles was allowed. After the breakup of the USSR, Russia, Belarus, Ukraine and Kazakhstan agreed to abide by the treaty. The purpose was to preserve the principle of mutual assured destruction, which was considered a guarantee of peace. If either American or Soviet leaders thought they had a reliable defense system, they might think they could attack the other nation and then be able to repel whatever weapons weren’t destroyed in the attack. President George W. Bush canceled the treaty in order to place ABM systems in Poland and Romania. He said such systems were necessary not just to protect against attack by Russia, but by “rogue nations” such as Iran. There are grave doubts as to whether these ABM systems would work. Maybe the best outcome would be that Russian leaders will fear that they might work and NATO leaders will fear they won’t work. INF Treaty. Negotiations of the intermediate nuclear force treat were begun by Ronald Reagan and Mikhail Gorbachev, and completed in 1987 during the George H.W. Bush administration. The purpose of the treaty was to eliminate Soviet or Russian missiles aimed at European targets and Europe-based missiles aimed at Russia. The treaty called for a ban on land-based missiles with a range of 500 to 5,500 kilometers (310 to 3,420 miles). It did not affect missiles fired from airplanes, ships or submarines, which was to the advantage of the United States, as the leading air power and sea power. Under the treaty. the U.S. destroyed 346 nuclear weapons and the Soviets destroyed 1,346. In the early 21st century, Vladimir Putin called for renegotiation of the treaty on the grounds that it did not set limits on other powers, particularly China, with its long land frontier with Russia. Later Russia reportedly developed and tested an intermediate-range missile, the 9M729, and may have deployed some of them. Putin claimed that the U.S. ABM system violated the treaty, arguing that nuclear warheads could be fitted on the supposedly defensive missiles. President Donald Trump announced cancellation of the treaty, based on Russia’s violations. Critics say that’s what Putin wanted him to do, since it frees Russia from any treaty obligation.